Brand Against the Machine offers proven and actionable steps for companies and entrepreneurs to increase their brand visibility and credibility, and to create an indispensable brand that consumers can relate to, thus becoming life-long customers. Discover the aspirational currency that makes your brand one that people want to be or want to be friends with. Learn how to be real with your audience and make strategic associations to establish credibility. 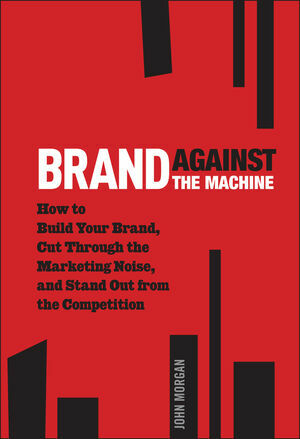 Brand Against the Machine will help you stand out, get noticed, and be remembered. Brand Against the Machine is the blueprint for how to market your brand to attract better clients and stand out from the clutter that is traditional corporate branding and marketing. Ditch your traditional corporate branding and marketing, and exchange it for something memorable. Your customers will thank you for it. John Morgan is the President of Brand Against the Machine, a company that specializes in personal and corporate branding and online marketing and helps entrepreneurs position themselves as leading authorities to their target market. John has worked with companies in more than 300 industries, including Fortune 500 companies and Hollywood celebrities. He regularly speaks to audiences ranging from 50 to 3,000 people and has been featured on FastCompany.com and MSNBC, among others.